Franchise quarterback Jimmy Garoppolo, who is undefeated as a starting NFL quarterback, playing for the New England Patriots and the San Francisco 49ers today became the highest paid professional football player in NFL history on an average-per-year basis. General manager John Lynch was not going to let him get away. The San Francisco 49ers and quarterback Jimmy Garoppolo on Thursday, February 8, 2018 agreed to a five-year, $137.5 million contract. Detroit Lions Quarterback Matthew Stafford previously held the high-water mark at $27 million per year (a five-year, $135 million extension) signed in August 2017, but today Garoppolo’s deal topped that with an average of $27.5 million. The quarterback from Arlington Heights, who learned football at Rolling Meadows High School and Eastern Illinois University is now higher paid than Patriots Quarterback Tom Brady and Green Bay Packers Quarterback Aaron Rodgers. 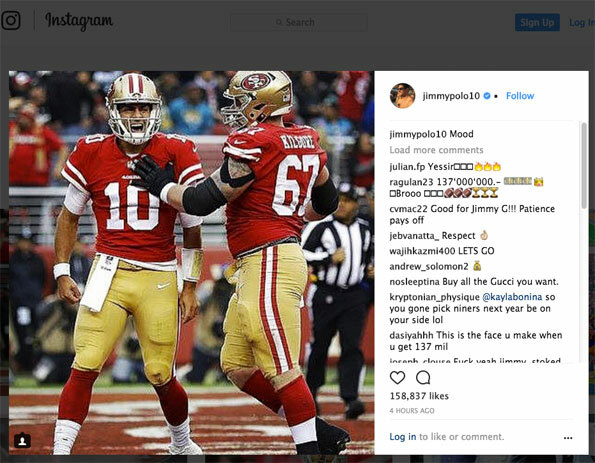 Jimmy Garoppolo celebrates his new salary with an Instagram Roar. Garoppolo has led a charmed NFL life since arriving in San Francisco in October 2017 at the trade deadline in a swap with the New England Patriots. The 49ers sent a second-round pick (either the 41st or 43rd overall, pending the results of a coin flip) for Garoppolo. The Patriots bet their future on Tom Brady, and there were rumors that Brady didn’t want Garoppolo breathing down his neck. Whatever the reason, the Patriots apparently gave up a star quarterback. Last season, Garoppolo managed to keep a perfect record as the San Francisco 49ers starting quarterback. After adopting a 1-10 record, subbing in the SeaHawks loss, and before the team’s Week 13 game against the Bears (his first 49ers start), Garoppolo helped the 49ers close out their season with five-straight wins, beating the Bears, the Texans, the Titans, the Jaguars, and the Rams. Garoppolo completed 128 of his 178 attempts this season, which was good for 1,560 yards. He coordinated seven touchdowns to his five interceptions and one fumble. The 49ers beat the Jaguars more handily than the Patriots beat them in the AFC Championship game Sunday, January 21, 2018. 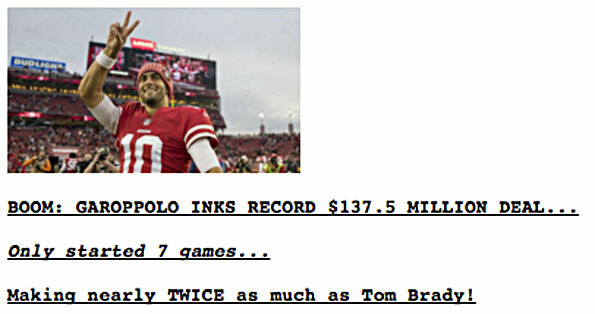 Jimmy Garoppolo salary news on Drudge Report. The 49ers closed last season 5-0 when Garoppolo started. He threw for 7 TDs, 5 interceptions and 1,560 yards in his six 49ers games (five starts) after the trade. Starting out the 2016 Patriots season, Garoppolo previously started two games for the Patriots in place of a DeflateGate-suspended Brady to start the 2016 season, winning both games. The San Francisco 49ers also hold nine draft picks, after giving the Patriots their second-rounder for Garoppolo. The San Francisco 49ers will pick either ninth or 10th in the draft and hopefully will be able build a protective grid of offensive players to guard their highly paid quarterback.